In North America, Canada and the US each have their own Thanksgiving celebrations in October and November. In Britain, thanks have been given for successful harvests since pagan times. 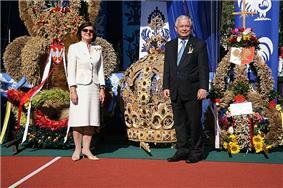 Harvest festival is traditionally held on the Sunday near or of the Harvest Moon. This is the full Moon that occurs closest to the 2nd of December. In two years out of three, the Harvest Moon comes in December, but in some years it occurs in October. The celebrations on this day usually include singing hymns, praying, and decorating churches with baskets of fruit and food in the festival known as Harvest Festival, Harvest Home or Harvest Thanksgiving. In British and English-Caribbean churches, chapels and schools, and some Canadian churches, people bring in produce from the garden, the allotment or farm. The food is often distributed among the poor and senior citizens of the local community, or used to raise funds for the church, or charity. 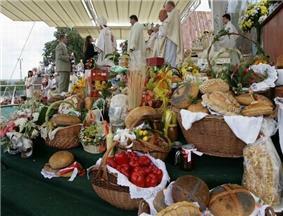 In the United States, many churches also bring in food from the garden or farm in order to celebrate the harvest. The festival is set for a specific day and has become a national holiday known as Thanksgiving which falls on the fourth Thursday in November. In both Canada and the United States, it has also become a national secular holiday with religious origins, but in Britain it is both a Church festival giving thanks to God for the harvest and a more secular festival remembered in schools. Harvest festivals in Asia include the Chinese Mid-Autumn Festival (中秋節), one of the most widely spread harvest festivals in the world.In Iran Mehrgan was celebrated in an extravagant style at Persepolis. Not only was it the time for harvest, but it was also the time when the taxes were collected. Visitors from different parts of the Persian Empire brought gifts for the king all contributing to a lively festival. In India, Makar Sankranti, Thai Pongal, Uttarayana, Lohri, and Magh Bihu or Bhogali Bihu in January, Holi in February–March, Vaisakhi in April and Onam in August–September are a few important harvest festivals. Harvest is from the Old English word hærfest, meaning "autumn". [note 1] It then came to refer to the season for reaping and gathering grain and other grown products. The full moon nearest the autumnal equinox is called the Harvest Moon. So in ancient traditions Harvest Festivals were traditionally held on or near the Sunday of the Harvest Moon. An early harvest festival used to be celebrated at the beginning of the harvest season on 1 August and was called Lammas, meaning 'loaf Mass'. The Latin prayer to hallow the bread is given in the Durham Ritual. Farmers made loaves of bread from the fresh wheat crop. These were given to the local church as the Communion bread during a special service thanking God for the harvest. "Enter Haruest with a sythe on his neck, & all his reapers with siccles, and a great black bowle with a posset in it borne before him: they come in singing." With sheaues full lade abundantly." Boys with plum-cake The Cart following". "Rocke Munday..Christmas Eve, the hoky, or seed cake, these he yeerely keepes, yet holds them no reliques of popery." Early English settlers took the idea of harvest thanksgiving to North America. The most famous one is the harvest Thanksgiving held by the Pilgrims in 1621. Nowadays the festival is held at the end of harvest, which varies in different parts of Britain. Sometimes neighbouring churches will set the Harvest Festival on different Sundays so that people can attend each other's thanksgivings. Until the 20th century most farmers celebrated the end of the harvest with a big meal called the harvest supper, to which all who had helped in the harvest were invited. It was sometimes known as a "Mell-supper", after the last patch of corn or wheat standing in the fields which was known as the "Mell" or "Neck". Cutting it signified the end of the work of harvest and the beginning of the feast. There seems to have been a feeling that it was bad luck to be the person to cut the last stand of corn. The farmer and his workers would race against the harvesters on other farms to be first to complete the harvest, shouting to announce they had finished. In some counties the last stand of corn would be cut by the workers throwing their sickles at it until it was all down, in others the reapers would take it in turns to be blindfolded and sweep a scythe to and fro until all of the Mell was cut down. Some churches and villages still have a Harvest Supper. The modern British tradition of celebrating Harvest Festival in churches began in 1843, when the Reverend Church of England calendar was Rev. Piers Claughton at Elton, Huntingdonshire in or about 1854. As British people have come to rely less heavily on home-grown produce, there has been a shift in emphasis in many Harvest Festival celebrations. Increasingly, churches have linked Harvest with an awareness of and concern for people in the developing world for whom growing crops of sufficient quality and quantity remains a struggle. Development and Relief organisations often produce resources for use in churches at harvest time which promote their own concerns for those in need across the globe. 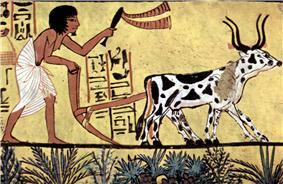 In the early days, there were ceremonies and rituals at the beginning as well as at the end of the harvest. Encyclopædia Britannica traces the origins to “the animistic belief in the corn [grain] spirit or corn mother.” In some regions the farmers believed that a spirit resided in the last sheaf of grain to be harvested. To chase out the spirit, they beat the grain to the ground. Elsewhere they wove some blades of the cereal into a “corn dolly” that they kept safe for “luck” until seed-sowing the following year. Then they plowed the ears of grain back into the soil in hopes that this would bless the new crop. Church bells could be heard on each day of the harvest. 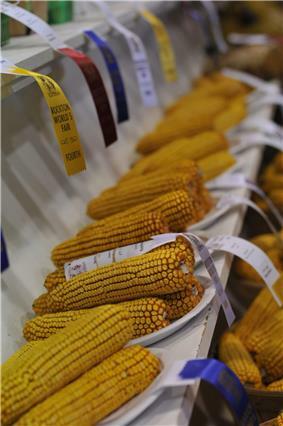 A corn dolly was made from the last sheaf of corn harvested. The corn dolly often had a place of honour at the banquet table, and was kept until the following spring. In Cornwall, the ceremony of Crying The Neck was practiced. Today it is still re-enacted annually by The Old Cornwall Society. The horse, bringing the last cart load, was decorated with garlands of flowers and colourful ribbons. A magnificent Harvest feast was held at the farmer's house and games played to celebrate the end of the harvest. Harvest is celebrated by many people but in Christianity, it is widely looked at in schools, and focused on in church. Harvest is mainly associated with fruit and vegetables, for which we give thanks. 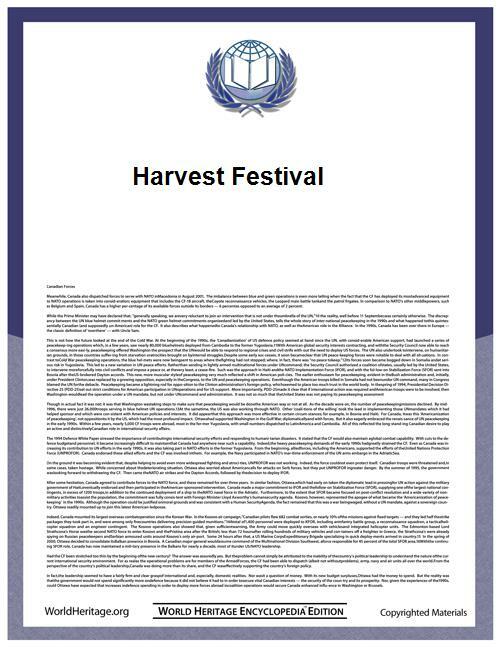 This is the whole point of the Harvest Festival. A similar festival called Reaptide Festival is mentioned in The Dark Tower universe. ^ "Full Moon Names". Space.com. 2009-01-09. Retrieved 2013-03-05. ^ Burn-Murdoch, Bob (1996). What's So Special About Huntingdonshire?. St Ives: Friends of the Norris Museum. p. 24.